Welcome to Forget Ne Not. We are based in Worcester Park but deliver to all the surrounding areas. We have been in the Floristry business for over 10 yrs. 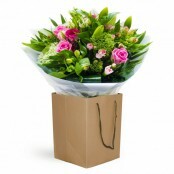 We specialise in a full range of flowers and gift ideas for every occasion, including weddings and funerals. Whatever your requirements we can supply a wide variety of traditional, stylish and contempory flowers. Our aim is to provide the sevice we would like to receive ourselves. Our stock of flowers is complimented by a wide selection of gift ideas such as cuddly toys, balloons, vases and baby bouquets. Whatever your occasion and budget we have something for you. We can also supply a selection of indoor and outdoor plants. We offer a sympathetic caring service including home visits if required. Please contact Siobhan our design specialist and we will create your ideas or suggest one from our wide selection.